Food Costs > How Much Do Oranges Cost Per Pound? How Much Do Oranges Cost Per Pound? An orange, along with the grapefruit, clementine, lemon and lime, is a type of citrus fruit. Eating an orange can give you an extra boost of Vitamin C and an orange a day can help strengthen your body’s immune system. How much do oranges cost? The cost of an orange will depend on the type of orange, the time of year, where it’s being purchased, the quantity and geographical location. A bag of navel oranges at the local grocery store can cost anywhere from $1 to $2 per pound, and most bags will weigh about five pounds. Individually, an orange can cost around $0.50 to $1 on average. For example, at the time of this writing, our local Walmart was charging $0.50 per navel orange. 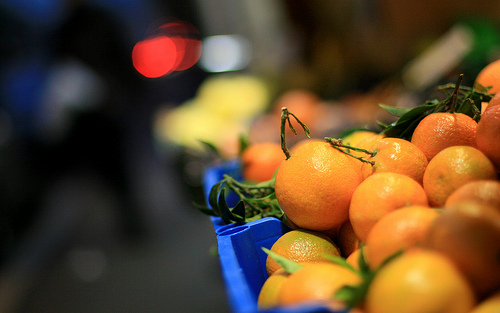 This USDA report said the average price of fresh oranges was $1.04 per pound in 2013. Statista, since 1995, has tracked the prices of navel oranges in the United States. In 1995, the prices were as low as $0.64 per pound, but as of today, the prices are closer to $1.17 per pound. A box of navel oranges, often coming in 20 to 40-pound quantities, can cost as little as $0.75 to $1.25 per pound total. Blood oranges, another popular variety, are known for its sweet center and vivid deep ruby red color. These types of oranges, depending on the same factors mentioned, can cost closer to $3 to $6 per pound. Clementine oranges, often sold by the “Cuties” brand, sells for $3 to $7 per three-pound bag. Typically, oranges are going to come in a mesh bag that weights up to five pounds. Sometimes, this mesh bag is placed in a wooden box to make it easier to carry. Each pound should yield about two to four oranges, depending on the size. If you purchase individual oranges, you can pick them and place them in a bag that is provided in the produce department, similar to other fruits such as peaches, apples, peaches and pears. This bag will then be weighed at the cash register and you will be charged accordingly. Oranges sold in the United States will typically come from Florida and California. However, some can be shipped from as far as the Middle East or Mexico. Refer to the packaging label to see where the oranges you purchased originated from. When choosing one, always look for a nice firm, smooth skin. A local farmers market is almost always cheaper than the local grocery store. As with any fruits, a grocery store will have oranges for sale, especially while they are in season. If you live in the right area, consider going to a u-pick farm to save on costs.